This treatment consists of dispersing a gas under pressure through a liquid. In the past, this process was restricted to injecting air through basic devices such as baffles or diaphragms. However, this technique has gradually become more widespread in direct oxidation applications using air, and for CO2 or ozone diffusion into drinking water treatment. into a contact structure; in this case, the systems used are identical to those described for activated sludge aeration: Oxazur, Vibrair, Dipair, Flexazur, porous Domes… (see biological processes). Water can also be aerated by “bubbling” large amounts of into a shallow height of water (0.25-0.30 m in drinking water). However, with this process air flow rates can be 30 to 60 times higher than the water flow rates. The object of the contact media is to extend the exchange surface area and to create a contact time following the diffusion system. The untreated water and the pressurised air are fed, co-currently, at the bottom of the tank. The aerated water is collected from the surface. The presence of a contact media improves the treatment (figure 2). This type of aerations tends to be used more specifically with water containing suspended solids. 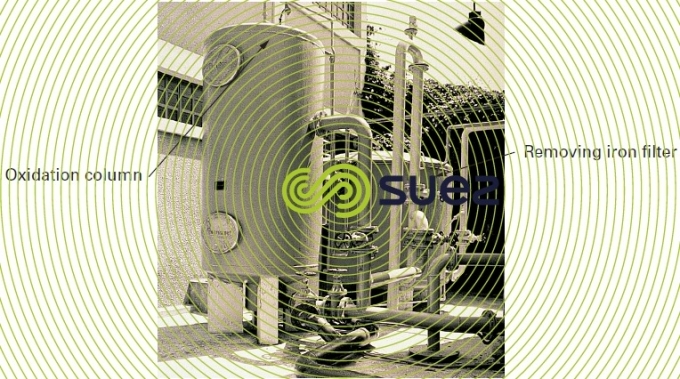 With a 4 m deep reactor, 70 % to 80 % saturation levels are feasible providing high air flow rates (50 to 100 m3 ·h–1 per m2) are used with water flow rates of 10 à 30 m3·h–1 per m2. These appliances are often used to remove iron from ground water extracted at deep levels. The closed oxidation column consists of a bed of volcanic rock laid over a plenum plate. (see also Iron removal). Raw, pressurised, water, is fed into a mixer that receives a supply of pressurised air. The water-air mixture is sent to the bottom of the packing bed. Any excess air is discharged to the atmosphere through a pressure relief valve. The water is collected from the top part of the column (photo 5).